2AM here in my tent. It’s raining, has been for hours. It was a wet weekend. Why am I awake? I don’t really know to be quite honest, I went to bed exhausted and fully expected to sleep through the night, but every now and again that doesn’t happen. It usually has to do with a certain someone I tend to think about a lot in my quiet moments, and tonight is no different. It’s frustrating, and whereas before it still hurt, as it does now, it also seemed to nurture some sense of connection between her and me that gave me hope for an eventual re-connection. It felt like I was simply paying my dues for still having the desire and capability to continue to love her. As anyone who’s been there knows, it is anything but a painless process. But now I’m mostly just annoyed with this. There isn’t anything to be done right now with these feelings, and there won’t be for a while still. Graduate school is still just under a year away, and by then, who knows? Life is nothing if not a changing proposition, and this is a two-person dance after all. There's no guarantee that, if my feelings remain unchanged, her's will be too. I suppose if I do what I always intended to do – put myself back into a situation where I could be physically close to her again, thus cutting out the main reason for us having to grow apart to begin with – then one way or another I’d get the answer to what has been and continues to be a giant, lingering question mark in my life. But again, that’s quite a ways off, and I might get a different answer than I expected I would when I first made the decision not to go to London and instead continue to try and be out in this kind of work, doing it, and becoming someone I can honestly say I’m proud to be. And in the end, it was the right decision, because that is exactly what is happening, and if I didn't give myself the chance to do this, I'd have regretted it, no matter how happy I might have been with her. In truth, I'm incredibly happy right now because as of Wednesday just past, the biosand filter program has hit our primary objective: building and installing 250 filters in three months. 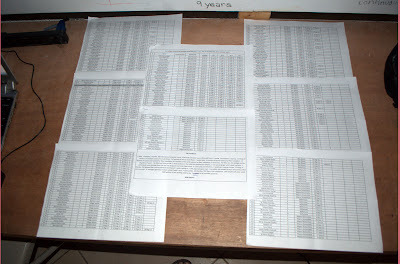 That’s 250 families with clean water, over 1000 people. The organization is proud of the program, and I can honestly say Paddy and I worked our asses off, sometimes truly winging it as we learned on the fly, and the results followed. A lot of people didn’t think the task given to us was something we’d be able to pull off. But, we did, with two days to spare, and despite the best efforts of two hurricanes and other things that shut the base down for multiple days at a time. In the process, I've managed to get a small monthly stipend which takes some of the pressure off financially, and, most importantly, I've settled something inside me that had been bugging me since I first left Haiti in January - the feeling of having squandered a fantastic opportunity. So yes, this is a good time in my life, all things considered, even if I do still have those moments where the gap that she used to fill in me makes itself felt. That's not something I'll probably be rid of until the I take the steps needed to get an answer to that question, and that's in the future, so hey, nothing to be done about it now. Accept it and continue. ...that got a lot of families safe, clean drinking water. Bon bagay! 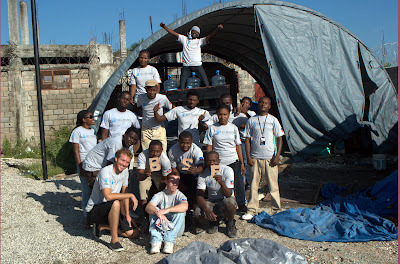 Speaking of bon bagay, even more good news in regards to the work being done here: a decision has been made from the All Hands Volunteers board to extend Project Leogane into 2012. That means that three core All Hands programs will continue into next year, with biosand filters being one of them (the others being our school build program, and our livelihoods program). We’ve purchased four more molds and are ready to double our rate of production, and we are playing with the possibility of quadrupling our production output to 16 filters a day. If we do that, I believe that would make us the largest biosand filter program currently in Haiti, and would see us able to get clean water to over ten thousand people in under six months. That’s no small accomplishment. However, quadrupling production poses some significant challenges and would require a total rework of our production yard. It can be done, but at the moment Paddy and I need to figure out if it is worth it give the timeframe and the fact that we both know All Hands will eventually leave Haiti. Regardless, we will, at the very least, be doubling our production and will have a longer time-frame in which to install the filters, so we'll be able to get clean water to far more people. That's a good thing. Another side project I'm working on is helping a friend of mine get back into high school and get her diploma so she can pursue her dream of being a nurse. At the moment, my friend Prakash, who I went to high school with in California and who now works for Google, donated enough to get her prior school debts paid back, and I got her set up with her books and school uniforms, so I'm happy to say as of last week, Jenny was back in high school. Seeing her turn up to the base after her classes got out in her school t-shirt made me smile. But tuition for this year still needs to be paid, and I'd like to raise enough money to see her through the remaining years of high school she has left (three in total) and maybe even help fund her if and when she gets accepted into nursing school, so yea, I'll post more about that project when I'm done setting up a website for it, and getting a fundraising campaign live on one of the online fundraising websites. Right then, if I don't at least attempt a return to my tent and hopefully the sleep that will follow, I'm going to be useless tomorrow.